Find pictures of Barabara and discover interesting facts and information about the Barabara. 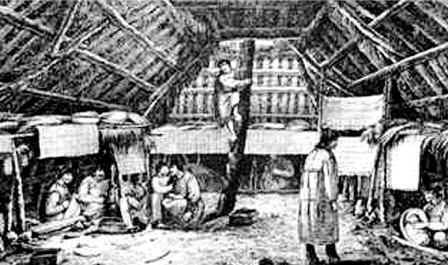 A Barabara was a typical structure used as a partially underground house style that was built by the Aleut tribe of the Arctic cultural group who inhabited the Aleutian Islands of Alaska. Learn about the structure and the interior of the Barabara with pictures and images together with facts and information about the lifestyle of the people who lived in this type of home. What does the word Barabara mean? Definition: A Barabara was an oblong shaped, semi-subterranean, sod-covered, arched-roofed, communal structure. It was similar to the well insulated pit houses built by other Native American Indian tribes. The barabara varied in size but were built to house an average of twenty people. The name of this type of house derives from the Greek word 'baraboras' meaning "foreign, barbarian" and the name was first used by Russians who explored the Aleutian Islands in the 1700's. What was the Barabara used for? The Barabara was the name given to the sod-covered houses built by the Aleut tribe who were located in the Aleutian Islands of Alaska. Some Inuit people also lived in barabaras. Every Native tribe choose a type of housing to suit their lifestyle, the climate, the environment and the natural resources (known as biomes) that were available to them. These well constructed underground houses or lodges made good use of the limited materials available to them in the treeless, tundra region including moss, heath and lichen. Driftwood was collected to include in the construction as were whale bones which were strong and flexible. How was a Barabara built?